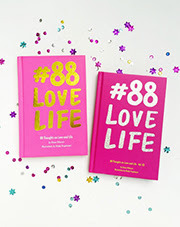 Take a Look by Dinda Puspitasari: #88LOVELIFE is Finally Revealed! Finallyyyy I can reveal my secret project, Alhamdulillah. I’m happily announcing that #88LoveLife is my latest project with Diana Rikasari. Its a book full of inspiration and colors, written by Diana Rikasari and illustrated by me. Its not easy to keep this as a secret for months, really. Anywaaay, the book will be published in my favorite month, November (its my birthday). Double excitements!